The deliberate large-scale manipulation of the Earth's environment, called geoengineering, could be one way to cool the Earth or help reduce levels of carbon dioxide in the atmosphere. But scientists are aware that these technologies are in very early stages of development and remain untested on a global scale. Although there are great risks in deliberately interfering with nature to cool the planet, some researchers say that if the concentrations of carbon in the atmosphere reach a critical stage, geoengineering might become the only way to take control of our climate. On the other hand, others worry that having the technology to "reverse" climate change could be seen as a get-out-of-jail-free card and that more effort should be put on existing ways of reducing emissions. Steve Rayner of the Oxford Geoengineering Programme, UK, says that there is no easy answer, but it would be "irresponsible for us not to explore the potential to understand the technologies as best we can". "Throughout human history the technologies of one generation created problems for the next. We have to find some way to deal with that; it's part of the evolution of human society," he adds. Geoengineering refers to the deliberate large-scale manipulation of the Earth's environment to counteract climate change. There are essentially two ways of doing this. The first is called Solar Radiation Management (SRM) and involves reflecting more of the Sun's rays away from the planet back into space. One proposed method of SRM involves putting sulphur aerosols into the high reaches of the atmosphere. This mimics what occasionally occurs in nature when a powerful volcano erupts. For example, the Mount Pinatubo eruption in 1991 injected huge volumes of sulphur into the stratosphere. The particles produced in subsequent reactions cooled the planet by about 0.5C over the next two years by reflecting sunlight back out to space. Using SRM would only address the symptoms and does not tackle the issue of rising concentrations of carbon dioxide (CO2). That is what the second option would aim to address by removing the CO2 already present. A number of ways to do this have been proposed; these approaches are known as Carbon Dioxide Removal (CDR). This would tackle the root cause of the problem, but Prof Rayner says, it would be very slow to have any effect and would require extensive financial investment. "The irony is the SRM is seen as being fast acting and has high leverage technically, but is probably the most difficult and distant prospect from a governance point of view." The Intergovernmental Panel on Climate Change (IPCC) has previously stated that geoengineering could provide important solutions to tackling climate change but it also says that more research is needed in the area. It remains to be seen what the latest IPCC report - known as AR5 - will have to say about the field. A major report in 2009 by the UK's Royal Society also suggested that "CDR and SRM geoengineering methods should only be considered as part of a wider package of options for addressing climate change". And while the idea of geoengineering seemed to have gained traction several years ago, proposals on a global scale have failed to take shape. For many years now, an international agreement, the Kyoto Protocol, has set targets for industrialised countries to cut their greenhouse gas emissions. In 2012, the UN climate talks in Doha extended the protocol. Prof Rayner sat on two previous IPCC assessment panels and believes such targets will be impossible to meet. He says that regardless of greenhouse gas reduction efforts, and even if supplemented by geoengineering technologies, some level of adaptation to climate change will be necessary. "The geoengineering technologies are seen as potential additional tools in the kit for dealing with climate change, not as substitutes for either adaptation or greenhouse gas mitigation," he told BBC News. He adds that documents compiled by the United Nations Environment Programme (Unep) and the IPCC suggest that it will not be possible to meet the targets "without finding ways of removing carbon from the ambient air". The most scrutinised technology so far has been ocean fertilisation, which involves using iron to stimulate phytoplankton growth in the ocean, increasing the uptake of CO2. One study, for example, has shown that about half of a phytoplankton (algae) bloom stimulated by iron sank to the deep sea, locking the carbon away on a potential timescale of centuries. But another showed that little CO2 was taken up by the organisms and that the potential for iron fertilisation may depend strongly on the location where it is attempted. And some schemes have attracted controversy: In July 2012, for example, 100 tonnes of iron sulphate was deposited into the Pacific Ocean, off Canada's west coast, in an attempt to help restore salmon stocks there. The move outraged environmentalists opposed to ocean fertilisation. While the idea continues to have its adherents, John Shepherd from the National Oceanography Centre at the University of Southampton, UK, who also chaired the 2009 Royal Society report, is doubtful about the benefits. "Ocean fertilisation involves huge interference with the ecosystem. You have a big environmental impact with a small desired side-effect." Progress on other projects has been hindered by factors external to their intrinsic merits. Last year, a project known as Spice, which was to have deployed a tethered balloon to disperse water into the air - as a prelude to spraying climate-cooling sulphate particles - was grounded. Core to the decision was a patent application lodged on some of the technology, though the team cited other concerns among the reasons for the postponement. Some scientists point out that manipulating the climate in one part of the world could have consequences elsewhere. Therefore, the argument goes, any action of this sort would need to be on a global level with international agreement. Changing another country's weather is even classed as a war crime under the Geneva Convention of 1976. Paul Nightingale of the Science and Technology Policy Research department at Sussex University, UK, says there is currently no infrastructure in place for such decisions to be made about our global climate. "As a consequence they will be extremely contested," he adds. Rose Cairns, also from Sussex University, has written a report for the Economic and Social Research Council (ESRC) on the area. She says one issue is that geoengineering remains an extremely ambiguous term because the technology is so diverse. Spraying aerosols into the stratosphere, for example, could be "highly controversial", while a global project to plant trees is likely to cause much less furore. As with any new technology, unpredictable side-effects of geoengineering cannot be ruled out. For example, in addition to any benefits it might have, it is thought that lacing the stratosphere with sulphate aerosols could deplete atmospheric ozone and exacerbate the risk of drought - particularly in Asia and Africa where it might adversely affect the monsoon. Again, it all comes down to the thorny subject of governance. Dr Cairns says: "Who would decide what would constitute an emergency that is serious enough to change the planet's temperature? "Who would make that kind of decision, bearing in mind some of these technologies risk, for example, affecting monsoons and changing rainfall patterns." 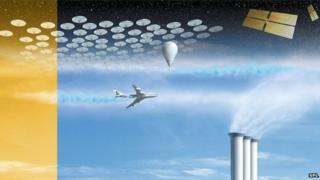 Another issue is that once geoengineering becomes an option, it could curtail the momentum for reducing CO2 emissions. "In that sense, conceptually, it's quite dangerous to even have it on the table," says Dr Cairns. Another factor would be the considerable cost of using new technologies on a global scale. While the financial cost might be outweighed by the environmental cost of inaction, Prof Nightingale says it would be better to spend money on making energy production greener. "The thermodynamics of taking CO2 out of the air makes it much more expensive than taking CO2 out of exhausts and power stations," he explains. "It seems such an expensive, complicated and risky set of technologies to be thinking about when we've got a lot of technologies that are environmentally benign." Echoing these points, Lord Rees, English Astronomer Royal and former president of the UK Royal Society recently said that geoengineering would be a political nightmare with unintended side-effects. For now, only small-scale geoengineering tests can take place as long they do not affect biodiversity, a rule agreed by the UN Convention on Biological Diversity in 2010. There is far more talk than action and opinions vary widely. There are some people who are enthusiastic - for example to save the Arctic sea ice - and others who think that it's far too soon to contemplate doing anything other than some limited research. We don't know enough about any of the proposed techniques to even contemplate deploying them anytime soon, so I see it as being several decades away. The worst thing that could happen is if people think this is going to be an easy way out and then try to do something on a large scale prematurely, which goes wrong. Professor John Shepherd, National Oceanography Centre, University of Southampton, UK. The limitation was in part achieved from heavy lobbying by campaigners from the ETC group. They said that their foremost concern was "the international control of planetary systems: our water, lands and air". They also expressed concern that wealthy states could see it as a "quick, cheap fix for climate change" leaving no resources to tackle the current climate issues. Andy Ridgwell, a professor of Earth system modelling at the University of Bristol, UK, counters by pointing out that we are already affecting biodiversity by "stuffing carbon into the atmosphere". But he says it is more likely that "we will keep adapting" than embark on large-scale geoengineering projects anytime soon. "Unless ice sheets collapse, I can't see a point at which we've passed a fundamental threshold where enough of the major emitters suddenly agree we'll have to do something," Prof Ridgwell says. "Given that geoengineering would need international agreement, I suspect that [temperatures] will keep creeping up and people will have to adapt." Prof Shepherd agrees that we're a long way from doing anything "other than talking and researching". But he adds that geoengineering could be the only way to actually reverse climate change. "Emissions control will never reverse it. We are making what is essentially an irreversible change to the climate on human time-scales. The planet is still out of balance, the oceans are still warming," he says.